The search for the smartphone with the best features is never-ending. As soon as we think a particular device is the best, the mobile manufacturers are so competitive that they release an even better device the next time. 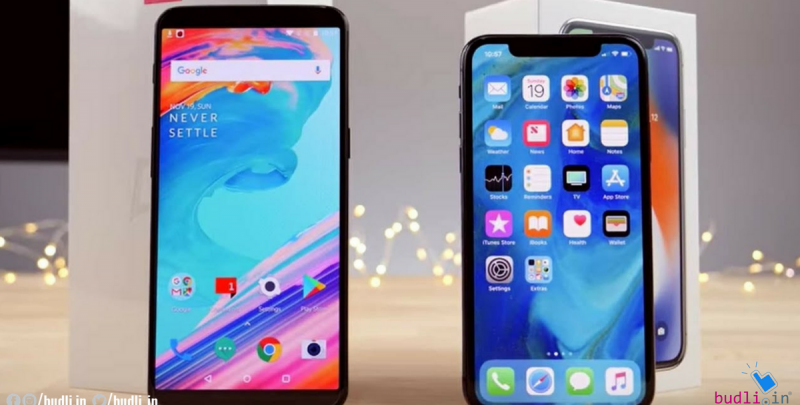 Here we have 2 smartphones from the leading brands: OnePlus and iPhone to compete with each other in the race to be the best smartphone. Let us see how these smartphones perform in different conditions and decide which is the best smartphone. OnePlus 6 has an Optic AMOLED capacitive touchscreen, 16M colors and in size 6.28 inches. This flagship comes with a resolution of 1080 x 2280 pixels, 19:9 Aspect Ratio. It has Gorilla Glass 5 Screen Protection. iPhone X has a Corning Gorilla Glass 5 Screen Protection and its size is 5.8 inches which is smaller than Oneplus 6. iPhone X has a better screen resolution of 1125 x 2436 pixels than OnePlus 6, 19.5:9 Aspect Ratio and for display protection Scratch-resistant glass, oleophobic coating. OnePlus 6 is powered by Qualcomm SDM845 Snapdragon 845. It has an Octa-core, 2.8 GHz, Kryo 385 Processor and Adreno 630 Graphics. iPhone X powered by Apple A11 Bionic. It has a Hexa Core (2.53 GHz, Dual-core, Monsoon + 1.42 GHz, Quad core, Mistral) and Apple GPU (three-core graphics). OnePlus 6 Processor is faster than iPhone X.
OnePlus 6 Primary Dual camera comes with 16 MP(f/1.7, 27mm, 1/2.6″, 1.22µm, gyro-EIS, OIS) + 20 MP(f/1.7, 1/2.8″, 1.0µm) with autofocus and Secondary with 16 MP (f/2.0, 20mm, 1/3″, 1.0µm), gyro-EIS, Auto HDR, 1080p. We can record videos with 2160p @ 60fps. iPhone X Primary Dual camera comes with 12 MP (f/1.8, 28mm) + 12 MP (f/2.4, 52mm), OIS, phase detection autofocus, 2x optical zoom, quad-LED dual-tone flash and Secondary with 7 MP (f/2.2, 32mm), 1080p@30fps, 720p@240fps, face detection, HDR. We can record videos with2160p @ 60fps. Oneplus has a better camera features than iPhone X.
OnePlus 6 comes with Non-Removable Battery 3300 mAh, Li-Po Battery and iPhone X come with a Non-Removable 2716 mAh, Li-ion Battery. In this section, Oneplus 6 has more battery capacity. iPhone X comes with an onboard 3 GB RAM and 64 GB internal storage and there is no extra card slot Oneplus 6 has 8 GB RAM and 128 GB internal storage and there is no extra card slot. iPhone X doesn’t have a fingerprint sensor and both the flagships have Face unlock feature. From all the above listings you will be able to decide on the best feature smartphone suitable for your needs. All the features are amazing, but the price? Too high right? I know! Want an equally awesome smartphone for a relatively lower price? Search no more, budli.in is here to serve you with the best smartphone for all your specifications. Budli is the largest re-commerce site for refurbished goods with the best variety of gadgets from mobiles to laptops to desktops. Don’t wait, go grab attractive discounts on all the devices only at budli.in.